Several years ago, my job required that I occasionally fly here and there for conferences and, oh, they were not fun. I know that many conferences today are wonderful events where wonderful people meet and expand their professional horizons but those for me were all about windowless conference rooms, buzzing fluorescent lights, and all hopes that I would be able to “get out!” and “see a new city!” dashed when I realized I would, in fact, need to file articles from my hotel room that night. On the lowest of these trips, I found myself gazing at a painfully unappetizing room service menu and came across an item called a “fried cheese collage” and this, I am sad to say, was the last straw. Well, it turns out, I do. I need to fry cheese. Flash forward many years and a more charmed career later, and I was invited a couple weekends ago to a brunch gathering of well-dressed people with websites (okay, that wasn’t the focus, just something I noted; related: I have no idea why they let me in) and well, I actually had to leave really early because we had other plans for the day but I did get to sit down for the salad course. Plates of salad were passed around, each topped with what I assumed was a seared scallop but turned out to be so, so much better. It was, in fact, a Panko-crusted round of goat cheese that had been fried to a crisp edge and melted, oozy center. Fried cheese. Fried. Cheese. I had to make it, as soon as humanly possible and when I went on my fridge-cleaning bender before our current vacation and found a dated log of goat cheese and, well, not a whole lot else in the fridge to use up, I found my chance. But that’s the brilliance of this crouton. You could take anything you had around — aging salad greens, some languishing rings of pickled shallot from a different recipe and the saddest hyperbright cherry tomatoes you ever did see — and with the addition of this golden, crunchy, warm topping, turn it into salad nirvana. If you’ll allow me to digress further, let me tell you why I think this is so important. I don’t think you need anyone’s help making peak-season, farm-fresh produce, gleaming with dewy, organic newness taste good. It just does. Shaved thinly or chopped roasted whole with a drizzle of olive oil, a squeeze of lemon and a showering of coarse sea salt later, dinner is served, and heavenly so. But where I live, most of the months of the year are not, in fact, the growing season. By January, it’s mostly bagged lettuce mixes and when, in April, my longing for a tomato is so intense that I’m willing to wing it with those aforementioned cherry hyperbrights, and these, my friends, take some good cooking, some good recipes, to make sing. A little melty crouton magic could be just that thing, the trick you keep in your back pocket to zip out for a Mother’s Day brunch, dinner party or a better-than-expected lunch when the thought of another sad little off-season, flavorless salad is too much to bear. Guys, when I get a recipe from someone and it works exactly as it is supposed to with no drama or adaptations needed the very first time, I am overjoyed. It is a very good day, and this was one of these. But did I fiddle? Of course I fiddled. I fiddled only enough to adjust the cheeses to amounts that were more easily purchased (i.e. most goat cheese comes in 4 ounce logs, that kind of thing), using a little more soft cheese and a little less of the firm stuff. The result is a softer crouton that melts more easily. We didn’t mind. Usage: I already made my argument for why I think this could perk up even the saddest excuse for a salad you could summon from the depths of your fridge (or, mid-winter produce aisle). Now, since it is indeed spring out there, imagine it on this salad (minus the parmesan) or this one (minus the feta) or atop grilled ramps, or gently wilted spinach, or… you name it. Mash together cheeses in a bowl, mixing until combined. 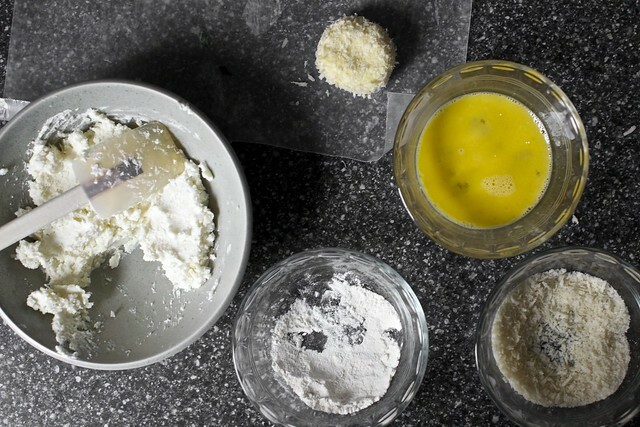 Form the mixture into four balls then smoosh each slightly into thick patties. Arrange three small dishes for dredging stations: Place the flour in the first one, beat the egg lightly in the second, and mix the breadcrumbs and salt in the last one. Heat a healthy slick of olive oil (the original recipe suggested 3 tablespoons; in a tiny skillet, I used closer to 2) in a small skillet over medium heat. Once hot, fry each patty until golden and crispy, about two minutes per side. It’s going to get melty (I’m not sorry) and seem pesky to flip once warm. I found using two forks made this easy-peasy. Briefly pause the crouton on paper towels to drain excess oil, before landing it on top of your salad of choice, then finish the whole thing with freshly ground black pepper. Repeat with remaining croutons. Eat at once. * Gouda, a Dutch cheese, is traditionally made with cow’s milk. You can buy it young (smooth, semi-firm and mild flavored), or aged (harder, darker, stronger-flavored with crunchy flecks), smoked, light, and even more ways. However, if you can find the goat milk gouda suggested here, perfect for goat cheese-phobes, it’s really amazing in these croutons, absolutely worth swinging by a cheese shop or grocery store with a great cheese counter for. (It’s also sold online from a variety of stores.) If you cannot get it, you could replace the gouda with another semi-firm cheese good for grating and melting, like a young cow’s milk gouda, gruyere, etc. ** If you can’t find or don’t want to buy Panko, here’s how I fake it: Preheat oven to 350 degrees. Tear one to two slices of soft, crustless white bread into 1-inch pieces and pulse them in the food processor until coarsely ground. This will make a generous half cup. Transfer crumbs to a rimmed baking sheet and bake until just barely golden brown and dry, about 15 minutes, stirring occasionally. Cool. Use. Wow, these look beyond amazing, a welcome addition to any salad! I think the title of this post says it all really, you didn’t need any more words (although I am, as ever, grateful for them). I love the sound of these! I always order goat cheese salad like this when I’m out, but hadn’t found a good recipe until now! Thanks! You’ve given me an immediate craving. Damn, I want a big bowl of this salad. Oh you had me at goats cheese! These look so lovely and I can just imagine the delightful surprise when you are expecting them to be something else. I’m definitely going to make these soon! Haha, loved reading this post. I’m especially terrible because I like to scoff at trends (both in food and fashion) as being unnecessary and over-the-top, and then before I know it, I want to be a part of this CSA business! I want to make a momofuku cake! And so on and on. And now I really, really want to fry cheese and put it on a salad. I’ve been seeing this around and am so glad you posted this on your site. Can’t wait to try it out. You touched on this topic in the baked-sour-cream-with-raspberries-and-brown-sugar post, the idea that fresh fruit is often made better by fatty dairy. For me, the same is often true when it comes to crunchy, raw, green things: a little cheese makes the greens better, and vice versa. p.s. you must know by now that when you go to Wisconsin on the book tour, you might reconsider fried cheese in the form of battered, deep-fried cheese curds. They are a singular delight and well-complimented by a good Wisconsin craft beer. I do this EXACT dish all the time! It’s such a quick way to make a ‘fancy’ meal. Add some herbs in with the panko before frying and you will be in heaven. So so good! Can’t say that I have ever tried fried cheese before but this might just change my mind. I Love this salad. I make it with Vegan cheese. Delish! And if readers are curious about the fried cheese collage, they can search for that phrase in the blog. The whole post is, indeed, a collage of food and travel frustrations! Talk about coincidence. I took my father to lunch today and had the warm goat cheese and spicy pecan salad. We sat and talked about how we should try and replicate this. Then, 25 minutes later, Deb has given us a recipe and instructions! The salad at the Carlyle in Alexandria, VA puts dates and cranberries in as well. It’s scrumptious. Will try this recipe over the weekend. I went to a restaurant a few years ago that had fried Brie on a salad. It was amazing, and now I’m craving a goat cheese variation. Hello mothers day brunch salad! I just hope fried goat cheese plays well with spinach and strawberries. I learned the power of breaded and fried goat cheese when my husband & I took a French cooking class for our anniversary a few years ago…so good! That looks amazing! 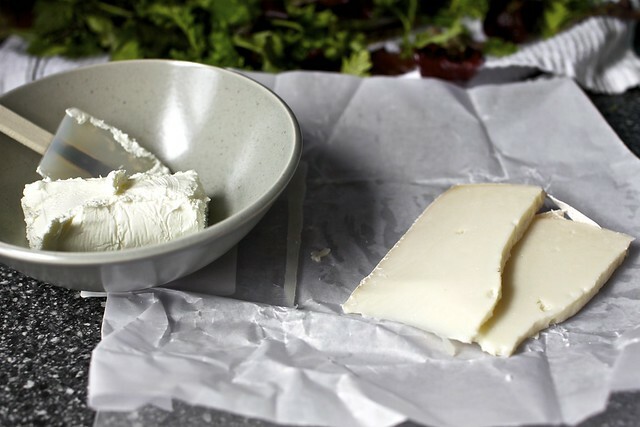 And I’ve been craving goat cheese lately – have to make this as soon as possible!! In de nomine Panko, et chevre, et Spiritus frommage, Amen. I have some gouda sitting in my fridge right now. I might be attempting this tonight! This looks too good not to try! This makes me so excited for summer produce! And, by the way, I love that you post what you were making in previous years. If I had been your neighbor/friend 5 years ago, I would have died with delight. To enter heaven, splash the warm goat cheese croutons with balsamic vinegar. Goat milk Gouda! The kind I get at the grocery store is called simply Hollandse Chevre and oh, my, it’s one of my very favorite cheeses! Love fried goat cheese. You can put the assembled rounds into the freezer for a few minutes to make flipping them easier. They will still get melty in the center when finished! Goat cheese can pretty much fix anything that passes for a salad. It’s also great on roasted vegetables. At age 78, most of my cooking has been done – that’s past tense! But I read this blog at each update and thoroughly enjoy it all. Is it the recipe and my imagined tasting or the clever and witty writing that has me enraptured? Don’t know and don’t care because I enjoy both. Thank you Deb for sharing yourself with the rest of us. That’s what I enjoy most of all – YOU! You obviously didn’t grow up in the midwest…Fried Cheese is AWESOME! Look at all that glorious cheese! I’m in heaven. This looks so perfect! Of course this looks divine, as does anything with fried cheese on top. I would not kick this salad out of bed for making crumbs…my favorite thing to eat with Gouda lately is a sandwich: rye bread with slices of pear and gouda, all perfectly panini-ed on the George Foreman grill. Crap, now I’m hungry again! Thank you for giving us another excuse to fry cheese. I’m glad you came to your senses! Yum! Deb! You must, MUST try Wisconsin fried cheese curds if you ever get to America’s Dairyland. You will never question the existence of fried cheese again. It’s a wonderful thing! This looks super tasty. I make something similar with an almond coating. As a true Minnesotan, I am always delighted by anything fried, particularly when it comes in the form of cheese. Great recipe! I don’t think I’ve ever tried fried cheese before. But this looks soooo good! I just have to give it a try. I second Brianne’s recommendation of fried cheese curds. Wonderful, tasty little things! I have found that in the absence of panko, crushed Rice Krispies work quite well, too! This is one of my favorite dishes! Warm, creamy, tangy, crunchy cheese with bitter, slightly salty greens. Heaven! Glad you’ve discovered it, too! Wonderful idea, thanks for sharing this great technique. Yes fried cheese may seem weird but on this side of the world, we have found it to be quite popular. 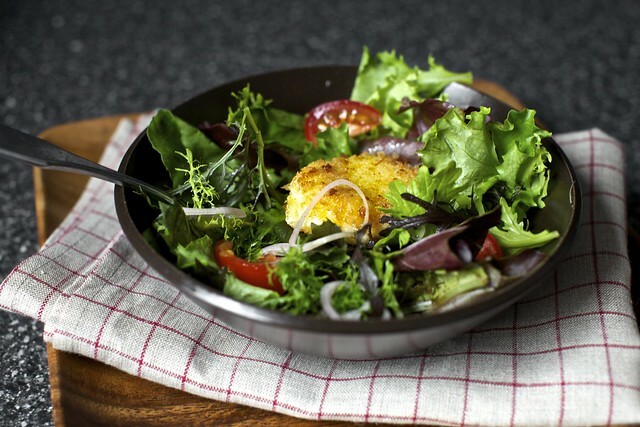 Love the added texture the panko crusted goat cheese brings to this salad! Have been secretly loving your blog since 2006. It’s now time to come out of the closet! I’ve made fresh goat cheese ‘croutons’ in the oven (from Diane Worthington’s, Taste of the Season) – but fried and with Gouda too? Yes, please. I look forward to trying this- I tried something similar a few years ago, but it was one of those times when I was feeling too ambitious for my own good and my version of melty goat cheese croutons were not all I had intended them to be. Alas: I shall try again. I love your addition of gouda to these as well- thanks for sharing! That brunch looked so lovely! All that gorgeous food and the beautiful setting… Any salad (even wilted greens) will turn into something magical with these cheese croutons on top! i’ll take this post as, “permission granted to panko encrust and fry those little goat cheese rounds at will”. I used to order this from a great brew pub in Salt Lake City, Red Rock Brewing Co. They served it on greens drizzled with pesto, and with thinly sliced pear. Perfect for a summer dinner! My friend always ordered their french onion soup. If she ever comes to visit me in Key West, I will recreate that favorite meal, now that I have your recipes for both things! I agree! I think everyone needs a little fried cheese in their life. This version looks just perfectly breaded, and I’m hoping for some type of fresh greens at the farmers’ market tomorrow that might go well with this. The ramps suggestion sounds just out of control too! This reminds me of a salad I had in Toronto topped with a round of phyllo-wrapped slightly-baked goat cheese. It was delicious. These sound HEAVENLY — especially with gouda! Hi Deb, Thanks for keeping smitten kitchen going–I’ve been following for years and I’ve made a lot of your recipes. Do you have any ideas on goat cheese substitutions? (goat’s milk allergy) I’ve seen you suggest ricotta in other recipes as a substitute. I may try to find a soft sheep’s cheese that melts in the same way and let you know if it works! amazing! I LOVE this idea! I’m from Wisconsin, and here those are fightin’ words. I’ll let it go, though, since you’ve since seen the light. This is my go-to dinner at my favorite local restaurant. Their salad is spinach, walnuts, dried cranberries, and apple. FANTASTIC. I have to agree that goat cheese croutons are wonderful to add to a salad. Especially good with arugula and some dried cranberries. I have never blended the soft goat cheese, but have coated with crushed nuts rather than panko before. I will give this a try as it looks WONDERFUL. With the plain soft goat cheese I pop them in the refrigerator for a few minutes so they don’t ooze away before they brown. Thank you. Can’t wait to make these. I remember an exchange in France where we ordered, in a restaurant, “deux chevres chauds sur son lit de salade” – two hot goats on their bed of lettuce – and almost died laughing. i think i may put in a request for this for my special mother’s day meal…ooh cheesy goodness. Warm cheesy goodness on a bed of wonderful greens. I can’t imagine anything better right now. I re-arranged all my weekend cooking plans and threw together some greens with these on top for dinner tonight. Happily, or perhaps dangerously, the neighbourhood cheese shop (located right next door to my apartment) carries goat gouda. The cheese ‘croutons’ reminded me of one of my favourite salads to order at a local pub – a round of fried goat cheese, mixed greens, toasted pecans and sweet red onion jam. I love cheese croutons…something always goes wrong and the cheese melts in the pan. boo! I have been doing this salad for years now, and it never fails to elicit moans of pleasure at otherwise very ladylike brunches – it really is awesome. An acceptable way to serve FRIED CHEESE! What could be better!? My recipe comes from Martha Stewart’s Everyday Living probably 5-10 years ago, but I love-love the idea of goat-milk gouda. I got into goat gouda when I was nursing a few years ago, and eliminating cows’ milk and it’s one of the few things I didn’t ditch when I could go back to ‘regular’ cheese. That and sheep’s milk feta – yum! I can’t wait to fry so cheese up! You really made a regular looking salad look extraordinary! You’ve obviously never visited Wisconsin! Fried cheese is our specialty, especially cheese curds! Love the salad, and goat cheese on super perfect toasted baquettes on the salad is nice, and not so.. fried. These week there is deep fried asparagus on every corner. “Heat a healthy slick of olive oil”! I really do enjoy the writing as well as the recipes! I want to eat this right now! Going to make it. wow, these are beautiful, deb! this particular post reminded me of the first time i had fried cheese. i lived in the south of spain a few years ago doing agricultural work on an olive vineyard, and one evening, my friend and i, exhausted from a day of harvesting, randomly decided to fry fresh goat cheese in local olive oil and honey for our dinner. the sweetness of the honey and the sharp, grassy olive oil was, as you said, heavenly. yum! can’t wait to try out this recipe! I ADORE salad with fried goat cheese. So lovely…great idea to stir in some goat milk gouda! FYI, it’s readily available (and affordable) at your local Trader Joe’s. I love the stuff…it’s a great compliment to many salads. I love it in a kale salad I make with lemony vinaigrette, shallots, capers, kalamatas, and toasted breadcrumbs. OOO i look forward to trying my hand at this! Someone get this gal a Wisconsin fried cheese curd, my heart is breaking! (But you get a pass with the crouton post…scrumptious!) Thank you, Deb, so much, for all the hard work you do…seeing a new post is like Christmas morning every time! Reminds me of a spin on one of my favorite French standards, salade de chèvre chaud! A circle of melty goat cheese can take any salad to a new level. Yum! For those too lazy to add even two steps to a recipe, I highly recommend Haloumi – just heat up some olive oil in a skillet, throw in the cheese (I usually slice it into sticks) and brown on all sides. In fact, you can even skip the salad (although I personally like it) and serve it with fresh lemon quarters that add great zing to the hot cheese. Works with a good sweet chili sauce too. Leanne is right about the French salade de chèvre chaud – it’s delicious – especially with curly endive and bacon bits. All that said, if I were just a fraction less lazy, I’d hop on down to the store and try this recipe. It looks delicious. I have made a similar salad before. And what makes this little meltycrouton even better is to have a delicious piece of crusty bread that you can spread a little of that warm cheese on and then you may just want another cheese crouton. A salad topped with warm fried goat cheese is one of my favorite things yet I’ve never made it myself, will definitely try this! LOL at your description of your other career… that had you languishing under the fluorescents…I can relate! Never could stay put whenever I found myself in such “real” jobs! Hurray for fried cheese of this order! Thanks! Wow. Thanks, Deb. Another awesome recipe. I have found that Trader Joe’s has goat milk Gouda. And goat milk Cheddar. And goat milk cheese slices (that are kind of like tangy mozzarella). That place has saved me since I can no longer tolerate cheese made from cow’s milk. Can’t wait to try these. Sounds like dinner to me! Fried cheese!!! Yummy!! That recipe looks amazing!Thanks so much for the inspiration! We, in Quebec, LOVE the maple syrup taste so I am thiking of bringing a sweet taste to this salad. I have found this cool site (called ROUGE maple) where I get my maple spices and salad dressing (the maple black pepper spice would be a great fit with this recipe!). It’s made of Organic maple syrup. I think I just found what I will cook for mother’s day! thanks and … Bon appetit! In Italy, we have fried cheese. It is not breaded and fried traditionally, though. It’s more like… seared, I guess. What’s crazy is that this cheese is made specifically for… searing. It comes in these blocks that you slice thickly. When it’s done, It’s golden and crispy and inviting on the outside, and milky, salty, gooey, chewy heaven on the inside. It’s a young cheese. I haven’t had it in a long while. I’m about to leave on a month long vacation, too, and my fridge has only condiments, a lemon, and some almond milk in it, or I’d try and raid it to make this delicious looking salad, which has reminded me of formaggio fritto. One of my favourite italian starters is mozzarella in carozza – literally mozzarella in a carriage of deep fried breadcrumbs. This sound similar, but maybe even more delicious. Full of calories maybe, but totally worth it. I want to go to Wisconsin. That is all. My chipmunks are gonna nibble this up. My daughter is making me dinner on Mother’s Day – I’m requesting this for my salad course! My mom’s getting the best mother’s day salad ever. Thanks, Deb! I love when I can make a salad a whole meal. Thanks for the introduction to Sunday Suppers and for this delicious recipe! I’m gonna make this tomorrow for my mum…she loves cheeses and she loves fried food (though she never has it): a total win-win situation! Mmmmm….warm, gooey cheese. Yes please! I’m in love with creamy goat cheese and frying it sounds like a whole new delicious level! I saw this recipe this afternoon and ran to the market and made it this evening. I followed the recipe exactly but also adopted one of the commenter’s suggestions and popped the croutons in the freezer for about 5 minutes before frying, and it helped them stay whole (easily turned with just a spatula). I served them over baby greens with thinly sliced granny smith apple slices, dried cranberries, and spiced pecans with a strawberry vinaigrette. It was amazing — thanks for a fantastic recipe! these look unnnnnggghhh so good! my problem with frying though? what am i supposed to do with the oil afterwards? i hate putting it in the trash, which is what i usually do, even though i know i’m not supposed to. i’m so hung up about it i’ve just stopped frying things. it’s a very sad time. Anna — Most frying oils can be saved. However, here you’ll only be using 2 to 3 tablespoons and I don’t think it’s worth saving. Echoing several other posters from the Midwest – you MUST have deep fried cheese curds – the white ones, not the yellow/orange ones. If the curds are especially fresh, they will squeak when you are chewing them. So so so good, especially as Kathy in St. Louis notes – with a Wisconsin craft beer. New Glarus Brewery’s Spotted Cow is my particular favorite and only available in Wisconsin. See…now you have to stop there on the book tour. I’m so happy you posted this, it reminded me of something I was smitten (hardy har har) with when I was studying in the Czech Republic, smažený sýr! Basically, it’s the same idea, but it’s served on a bun. It sounds like bit overwhelming, bread and cheese and anything else your heart desire, I know, but it. is. awesome. Especially with a good Czech beer. You can find it from street vendor as well as in restaurants. I found this post about it. If you’re ever there, you HAVE to try it! Hangrily, :-) this is one I must remember! I get together with girlfriends once a month for a salad supper and a DVD and had been wondering what I could serve at our next meeting. Now I know! And I hope all of this talk about Wisconsin fried cheese curds will get you to Madison! I’d also note that a local restaurant invites customers to “add a fried egg” to any sandwich order. I made these last night and served them on a bed of spinach drizzled with fancy olive oil and fancy balsamic vinegar I got for my birthday (wild mushroom sage OO and fig flavored balsamic — sounds like a strange pairing but they are wonderful together!). My boyfriend always enjoys my cooking but this time he actually rolled his eyes back in his head it was so good! However, I wish they had just a little more structure. Mine melted so much that a lot of the cheese oozed out and was wasted. :( Any ideas to make them a bit more sturdy? I used the cheese ratio from the original recipe, but subbed fontina for the gouda. Maybe a different cheese? Or pop the floured patties into the freezer for a minute before frying? This recipe is definitely book club worthy! Cannot wait to try it and impress all my friends. Wow! Blast from my past….my Mom used to make this recipe but would use a fresh mozzarella for the cheese. Many years later I made a tweak to this recipe (which I still haven’t told my Mom about! ), which I think kicks it up a notch…it may sound strange but it works. I mix in about a tablespoon of pure organic maple syrup in with the cheese to get that great sweet/salty play. I use Rouge organic maple syrup that I get online because of its unique taste but you use another kind I guess. I too remember the first time I had fried goat cheese. It was truly memory-worthy. I just made these for dinner with leftover goat cheese that needed to get used along with some manchego I had around- so good on a salad, paired with lentils braised in red wine with smoked paprika (thanks Mark Bittman)! p.s. I had a dream a little while ago where I was wandering in a bookstore looking for the Smitten Kitchen cookbook! DAMN! I just had dinner, and now have to go back and make some of these bad boys. I live in Belgium and these are often on a menu. They’re called cheese croquettes and have a mixture of cheeses and served with a bit of salad. I think they’re French in origin? Anyway, some restaurants also have them with baby shrimps inside. Either variety is delicious and since chain restaurants are not the norm here, the taste varies from restaurant to restaurant. I used to make these on my station when I cooked at a certain four star restaurant… and they were soooo good. I loved how they were called a crouton,— they seem so much more than that. The crispiness of the panko ( or home-made) compliments the creaminess of the warm cheese so nicely… gorgeous and mouthwatering post , especially with the beautiful greens! Totally agree about room service menus. Over here in England there used to be a craze for deep fried Camembert served with cranberry sauce or something. Your recipe though provides a lot of sophistication and maturity. Can’t wait to try it out with a nice glass of Riesling! I think it would be complemented by a lovely homemade tomato chutney just drizzled over in place of a salad dressing as well. Thanks for sharing. I am so in love with fried cheese! Thanks for the panko substitution tip. They’re near impossible to find in my corner of the world. And by near impossible I mean that I’ve never managed to find them, but they are rumored to exist in a highly fabled market I never can get myself to. One day I will, but for now I’ll try making your version at home! My little Cheesemonger heart just melted (harhar) when I saw that you, in fact, posted about cheese. I’m perhaps a bit obsessed with the stuff as it’s my line of work and also what I write about. I am actually now about to run out to the store for panko bread crumbs to rescue the handful of dried out chevre lumps in my crisper. If I don’t like goat cheese (I hear a collective gasp), what other cheese would work well in its place? Thanks! Nice suggestion on the panko alternative of white bread, Deb. I also like taking the guts of any half-eaten baguette that I have left lying around, and using them for the same purpose. Though, half-eaten baguettes shuold of course be the exception and not the norm. I remember the first time I had fried cheese… there’s a wonderful gourmet mexican restaurant in my neighborhood that makes a “calabacitas salad”. Fresh romaine with sauteed squash, onions, and corn dressed in a yummy balsamic vinaigrette topped with friend queso blano. I get it every time- it’s incredible. Why would anyone not want to buy Panko? Lord, that looks so delish. These look amazing. I love making my own croutons, I just printed this recipe out. Thanks! Just to add one more note to the Wisconsin fried cheese curds chorus, my absolute favorites are at The Old Fashioned in Madison. Also dipping them in ranch. Because why wouldn’t you? This looks pretty perfect…I’ll have to try it soon! A frequent visitor to Madison, WI, I also have to weigh in on the cheese curds at The Old Fashioned…they are the best I have every eaten, after an exhaustive search. Melty goat cheese croutons are one of my favorite things on earth. I usually bake them in my toaster oven. I will have to try this addition of gruyere, though. Sounds/looks so good! How do you always know exactly what I want? First that tasty risotto and now this? For real, you just… you get it. I cannot wait for your cookbook to come out. The end! Another reason I love your blog–I just New York Times’d that David Mcaninch article and now I totally have to go to Wisconsin and try fried cheese curds. Same thing happened when I read about your lobster rolls: now I gotta go to Maine! Thx for inspiring such great foodie leads from around the country with your recipes. We frequent a tapas restaurant that makes a fried goat cheese round like this. They drizzle some honey on top, and serve it with some almonds and guava jam. Delicious! Thank you for specifying GOAT Gouda, Deb. Although it seems a minor thing, many cows’ milk cheese types are now being made with goat milk, and they are worth seeking out. They are somewhat lower in fat & punchier in flavor than the cow variety, and highly digestible. I recommend a sprinkle of ground almonds or hazelnuts in the breading of these warm pillows. Yumtious! I daresay this is far more satisfying than a congealy cheese collage. Easy, delicious weeknight recipes are hard to come by, but for the past two months, I’ve been having great luck in planning my weekly menus using the “surprise me” feature here. I just click away until something looks good, collect enough good things for a week of dinners and voila–menu planned. The combinations of ingredients that you suggest are miraculous. Honestly, I don’t know how you make three or four ingredients taste so incredible. Anyway, I am absolutely ecstatic that you’ve written a cookbook–I am planning on working my way through it cover to cover. Oh dear lord. It’s been a LONG time since I had to make something as soon as I saw it, but this did it. I saw this last night and asked my husband to pick up goat cheese on his way home from work – just made this for lunch, and it transported me immediately back to the spring of 1997 when I spent two weeks living outside of Paris with a French family and they served this salad every single night after their main course – and ohdearlord how delicious. Had to try this tonight – it was wonderful!!! I used the remains of goat cheese that I had in the fridge, I’m guessing a bit more than 4 oz worth. 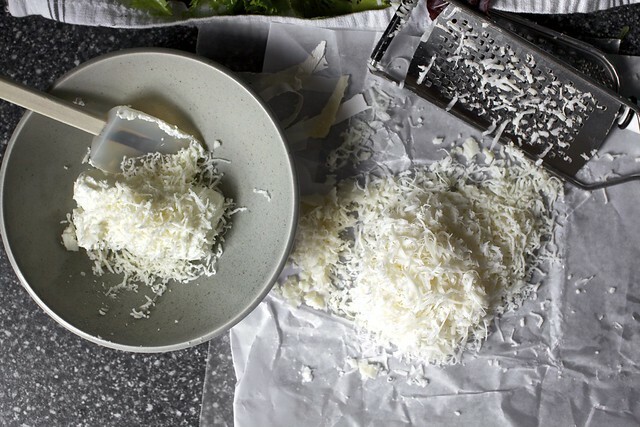 I also shredded a hard goat cheese that the grocery store employee (working the cheese display today) in place for the gouda your recipe called for. Only thing I added was a few pinches of herbes de province to the cheese mixture before I mixed it all together. Served it warm and oozy over a salad of greens that we got from our CSA today and it was an excellent and hearty side dish to our chicken-gnocchi main course. Oh – and I’ve printed out the recipe to bring to the grocery store employee, who asked me to drop it off if we liked how it came out. Love your blog! I think you read my mind! My favorite salad has fried goat cheese on it, and I’ve been wondering how to make it myself! This looks perfect! Thanks! I recently made a Chuck Hughes salad that had lovely homemade croutons along with bite-sized chunks of fried cheddar. It was amazing. I live with a goat cheese-phobe, but could very well make and eat this for myself! This look really tasty and easy to make! I gotta try this!!! Thanks for sharing! Very recently I tried the recipe of fried goat’s cheese topped on a fruit salad. Divine. Great recipe, I can’t wait to try this one later in the week. Takes me back to the summer I lived in France, 15 years ago. Versions of this salad were on cafe menus everywhere – delicious! Hangry – Love it! My husband uses that all the time to describe the point at which I’m so hungry I cannot decide what to eat…..
drool … the texture of these look amazing, I can only imagine how they taste! 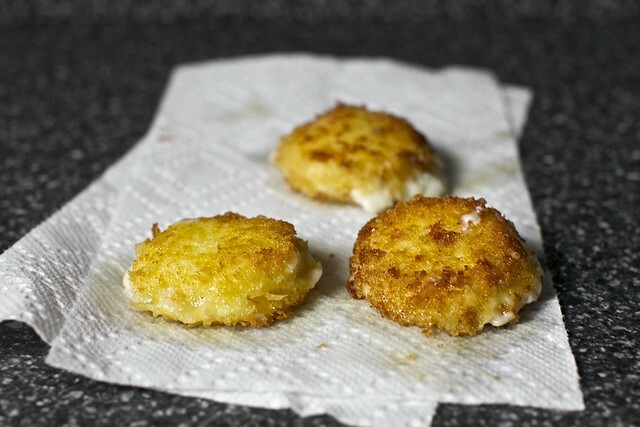 On any other blog, I would be put off by fried cheese but here, it just seems so right. Now I want fried cheese. What a scrumptious looking dish! Great presentation as well. Definitely going to give this one a go. Thanks for posting! Hi Deb! Looooove your website and am definitely buying your book when it comes out (also recommending it to all my food-loving friends). Just wanted so say that it breaks my (Dutch) heart when you call Gouda a Dutch cheese. The pasteurized cheese Americans eat have really nothing in common with the raw cheeses eaten in Europe. But what am I saying, you’ve probably stalked out the cheese section at Dean and Deluca, and know exactly what I’m talking about. Thanks so much for all the great recipes and insights in your life! I made this tonight and it was delicious (so much so that I ate all the cheese before taking a bite of salad!) I made my croutons in 1-oz instead of 2-oz portions and they nicely manageable, plus bonus crunchy surface area. This is a great addition to spice up a plain salad and I like that you don’t need a complicated shopping list. Thanks Deb! Look great. Will try tonight. I make something similar to this, but instead of frying the goat cheese I finely chop pine nuts, cover the goat cheese rounds in them and then bake them in the oven until just melty in the middle and toasted on the edges. So ethereally delicious, but no deep-fry related guilt! Great recipe, it was lovely. Will make it more often. These. were. divine. Goat cheese has been my true love for many years. Fried goat cheese for a few years, but I never pair it with anything. Just melty fried cheese balls and a fork, or no fork. I served your croutons with the last of the endive I could find, sliced almonds, honey and herbs. Heaven. Just like Kathy in St Louis said, deep fried cheese curds are a Midwestern delicacy. Hit the great Minnesota State Fair and enjoy! ohh. I’m so going to regrett these croutons at 7pm but that looks great. I know i should wait till morning but my stomach will just have to deal with it. I just made this and it is delicious! I have to say – top the salad with some fresh blueberries as well and serve a glass of chardonnay… My otherwise bad day suddenly got a whole lot sunnier. :) Thank you, Deb! Not sure what Kimberley (#151) means above. Gouda is a Dutch cheese (though there may be imitations). Although I’ve never heard it referred to as such here, “goat milk Gouda” is very Dutch, and in my opinion one of the greatest of all Dutch cheeses. I buy a aged variety at a small cheese shop in the town of Edam, which makes it itself, about a half hour north of Amsterdam; it is fairly hard but still can be sliced, and is truly divine. It is made with pasteurized goat’s milk; I was told that using unpasteurized milk would make the resulting cheese too strong tasting. Some cheeses here in the Netherlands are made from unpasteurized milk; most are not; you need to know what to look for. In any case, I’m delighted to hear that goat’s milk Gouda is becoming well-known in the US. Made this for dinner with friends last night. The salad with the melty, soft, and crispy cheese croutons almost brought us to tears it was so fabulous. One of the best dishes we have ever had. Definitely a keeper! Prepared the croutons in the morning and refrigerated them covered. I took them out 30 minutes before ready to serve. Then all I had to do was fry them up. I didn’t read the 162 comments above mine, so my apologies if this is a repeat concept, but I used cornmeal instead of all purpose flour and it was HEAVENLY. Oh thank you for sharing this awesome recipe. I love your blog and so appreciate it. I made these tonight, using Peppadew chevre and the goat gouda. Perfection. They didn’t all make it onto the salad. They will be making a featured appearance at my next dinner party. One of my favorite restaurants makes something similar with a local Caerphilly style cheese; I think I’ll be exploring versions of this with as many cheeses as I can. You’re my hero! First tzasiki potato salad and now goat cheese croutons??!! This is making my mouth water – WOW!!! Tried it last night, my man love it. And he said i made it better than in Restaurant… hehehe half credit must be your! ah, salade chèvre chaud! what you are missing is honey! Thanks so much for posting this fabulous recipe. I have been looking for a way to do fried cheese that wasn’t your typical tgi friday breaded mozzarella and this is a very tasteful and delicious way! BTW thanks for the fake Panko tip! This was divine for my dinner for one this evening and will be perfect prepared in advance for a larger group. Merci! I cannot believe I waited SO long to make these little babies!!! They came together so easily and went down even easier…. My, Oh My! They are fabulous! They’d been on my culinary radar ever since seeing your post weeks and weeks ago, Deb. So finally while others were barbecuing yesterday I made THESE….. It won’t be long before they top another yummy dinner-sized salad. Would tonight be too soon? Thank you again, Deb! I am a huge fan…. The mozzarella stick, elevated. Love it! You are the best, Deb, but I thought I made up the word ‘Hangry’. Now I realize you’ve been using it since ‘12, sigh. Some things do move from East to West. If you give me a yes…I will tell you how to fix your lemon cake problems.